Coronation chicken? I had no idea poultry had ever been crowned. Hard to imagine how that succession came to be – which came first, the chicken or the egg? (Oh, oh…kill him now before he lays another egg.) Must have been European (fried French) or Asian (egg roll royalty), given the addition of tea to the ceremony. Or maybe Middle Eastern – poached potentate? Anyway, those little munchkin sandwiches look good enough to munch, I mean eat. And the chutney – what is that, anyway? Think I’ve had it at Bombay Bicycle restaurant. Sort of a cross between marmalade and mincemeat? Good Morning,Jean!Here is a beautiful autumn's day!Thanks for the recipe!The tea set is delighting!Very beautiful!Hugs. Sully, your mind boggles mine! I knew not what sort of comment to expect from you, but it wasn't this! Who but you would think about the "succession," "the chicken or the egg?" Chutney falls into the category of relishes, rather like a pickle relish made of other things. I'd probably like your way better. I do enjoy a good chicken sandwich at tea. I so enjoy the shape of Royal Albert Tea sets! Maristela, thank you. So you are heading into winter soon? Enjoy! Thanks, Ellen! I didn't realize there were so many different shapes of Royal Albert until I saw a chart online. I pinned it to my Teatime board, I think. I LOVE the tea set - what an awesome gift. Thank you for the recipe, also. If I didn't know I would have guessed you and your friend were English ladies taking afternoon tea. Coronation Chicken takes you back to 1953, and the Queens coronation. You would of course be dressed in voluminous floral print dresses and your and you would crook the little finger of your right hand as you lift your new rose patterned teacups to your lips. There are some places, Jean, where you would fit straight in, the Isle of Wight, and New Zealand. New Zealand and the Isle of Wight are really England fifty years ago!!! I do love a good chicken salad, Jean, and really I prefer just a scoop on lettuce, to save room for other carbs, like a scone or a sweet! You know me, I do love my sweets...LOL! Your chicken salad sounds delish. Wasn't that sweet of your friends tp gift you with the OCR teaset??!! LOVE it! Mildred, thank you. Yes, it really was an awesome gift! I hope you'll try the recipe soon. Kitty, for an "official" afternoon tea, I want real tea sandwiches. But for everyday, I'm with you - hold the bread. And at a full-on afternoon tea I, unlike you, can happily skip the sweets entirely and just have sandwiches and scones. Hey, we should go together and trade! Tony, I must visit Isle of Wight and New Zealand because it's the England of 50 years (or more) ago that I am nostalgic for. We had a couple of visitors from England some years ago, and they told me I was more "English" than they were and that I was "posh." :D They had long since gone over to making their tea with teabags in a microwaved mug of water! Hi Jean, how wonderful that your friends were giving away the Old Country Roses tea set to you! Today is our last day of vacation in England and I think the first thing I will try out is your coronation chicken tea sandwich recipe when I am back home and have a moment of time. It will soothe the sadness of having to leave this wonderful country way too soon! I have eaten coronation chicken tea sandwiches here in the UK but had no idea how many ingredients are involved. Quite fancy stuff ;-)! Hope mine turn out well and look pretty. I have never cut off the crust when I make sandwiches...that's the best part. The chicken filling sounds very delicious. Christina, thank you. I feel honored that you visited my blog while you are yet in England! Let me know if you try my recipe. Thank you, Martha. York is an amazing place! I did not have coronation chicken there, though. I can say I have never had a chicken salad with so many tasty ingredients, I can only imagine how flavorful your sandwiches are. I must try your recipe! Thanks, BRnLC! I hope you'll try it soon and let me know what you think! My husband really likes it, too. While attending college, one of my jobs was at Lawleys of London, which sold all the very best china, tableware, and bits & bobs (Dalton figurines, etc). Old Country Roses had a very strong purchase point despite the expense (at the time, over $80 per place setting) &, though todays' young women seem less inclined to such tradition, even my daughter looks forward to someday inheriting her Grammas' Yellow Roses collection. Dear Jean: Looks like Old Country roses were on both our minds! I love your recipe and it is so perfect with the teapot! Thanks for sharing something wonderful as always! Mrs Shoes, that would have been the perfect job for me! I've always loved china and use it every day. I don't believe in "saving" anything for company or special occasions, as I figure every day is special. I'm glad your daughter appreciates her Gramma's china. Bernideen, thank YOU! I'm always glad when my post for the week is tea-related so I can share it at your link party. My daughter has a collection of Royal Doulton in the Moonlight Roses pattern. I have some Old Country as well as tea sets in other patterns that spoke to me at the time. I should stop listening to those voices in my head. I will have to try your chicken salad. It seems I collect chicken salad recipes too. Nancy, I hope you will try this one and let me know how you like it. Moonlight Roses is very pretty. There are so many beautiful patterns, I've just learned to say NO! P.S. You're correct about the 4-tiered trays. Good eye! AH, a dish from the 1950s! I just saw Rachel Koo feature this dish last night on her cooking show- looks like the dish is just as delicious as it was back in the day! Thank you, Margie. It's impossible for me to pick a favorite tea sandwich! But it's easy for me to pick the ones I don't like. When I go out for tea, smoked salmon is always on the tea menu; and I always ask for an extra egg sandwich instead. Fran, I've never had it the original way, a piece of chicken with a sauce; just the salad way for tea sandwiches. Jean - I have never had Cornation Chicken, but love the ingredients! Also like adding the chutney ingredients rather than the chutney. I love tea sandwiches but they are really hard to serve in Tucson. The air is so dry that a sandwich barely has a chance to be soft and delicate. My favorite kind? It will always be cucumber. Has been since I was a child. So nice for your friends to bring you their tea set. I love getting special items from friends. Thanks again for the link to the clotted cream! I am so excited fo make that. Wow. Fancy. Maybe I'll try making these next time I host brunch. Thanks for linking with the #DreamTeam. That said, I am very interested in your recipe, and am making a note! Thanks, Peachy Little. I hope you will. They are a treat! I agree, Quinn! Somebody wants to go to the trouble to make cute little sandwiches and put them on a pretty plate for me - well, it's my favorite, for that moment anyway! YUMMY! Why didn't you invite me over? The tea set is so gorgeous! You're smart - make way for pretty stuff, or prettier stuff! It DOES take energy to have a tea party, even a kiddie tea party. I'm always jumping up and refilling or wiping up. I love your new tea set! I've inherited a few from my mother and mother-in-law but just have them on display! And your chicken salad sounds fabulous! I do like an elegant sandwich. I'm going to give these a try in a brunch I'm giving next weekend, thanks for sharing. Thank you, Amalia. I hope you and your guests like them! PINKIES OUT! I love these delicate and refined little sandwiches! It's like a childhood tea party dream come true for my adult self. Jessie, thank you so much! Your comment gave me a great big smile! After my first time, I learned fast to wrap all my bread and sandwiches unless they were to be eaten immediately. In your honor, we had cucumber sandwiches for lunch yesterday! I was making a batch of my current favorite chicken salad, Maple Mustard, when I decided to keep out some of the chicken and make a bit of Coronation. We did like it a lot even though it wasn't served in tea sandwich form. I tend to make heartier sandwiches mostly using my homemade cranberry apricot yeast bread. I'm sure we will like it even more used as intended. Next, I want to try the clotted cream. I pick blueberries every year for the freezer so I can always whip up a batch of scones on a minutes notice. Having the berries frozen is the way to go as you suggested. Sounds good, Nancy! Isn't making bread fun! We more often have big sandwiches, too. Do let me know when you try the clotted cream. Jean, that tea set is gorgeous! I have actually made that salad before, but didn't know that's what it was called. I have apple, not apricot preserves in mine, but everything else is the same. I think I'll opt for the apricot next time. I also use a hot curry powder, which I love. I might try putting it between slices of bread another time, rather than just on my plate, for the sandwiches are so pretty! Thank you, Judy! My curry powder isn't very hot, so I added the dry mustard. If that hadn't zipped it up enough, I would've added a pinch of cayenne. But Mr Delightful deemed it "perfect," so I'm going to leave it alone. Of course, I love bread, but you gluten-free people could just wrap it in a butter lettuce leaf or put it in a cucumber cup. I love 'high tea' and these sandwiches looks so elegant. I also love your tea set. Thanks so much for linking up and sharing with us at #overthemoon link party. I've shared on social media. Have a great week and see you at the next OTM. Sue, thank you. And thank you for sharing on your social media; much appreciated! Thank you, Karen! Nothing worse than a dried out tea sandwich! I hope to have your understanding, my lovely lady, if during this period of the year I'm not much present on the web, our Short Lets and our works outside take me most of my time ... Honestly I'm publishing posts I have pre-scheduled just because of this reason and I'm so sorry not to be able to follow you as I'd love to and as you deserve, Dearest One, forgive me ! I feel I have to thank you for this so tempting recipe I didn't knew before, I absolutely LOVE it ! Dany Dear, lovely to hear from you! I understand completely, but hope you are not working too hard! Take good care of yourself during this busy season. Afternoon tea is such a wonderful way to make an ordinary day extra special! Love your Coronation Chicken Sandwiches, Jean. I've pinned the recipe and shared on our Hearth and Soul Facebook page. How lovely that your friends gave you the beautiful Royal Albert china!! Thank you so much for sharing, and for being a part of Hearth and Soul. April, thank you so much. I'm really enjoying the tea set and you are so right about afternoon tea - it can make the most ordinary day extra special! Your social media shares are soooo appreciated. I have honestly never met a tea sandwich I didn't like, but Coronation Chicken is definitely one that I love. I do miss the variety of jarred chutneys available in the UK shops, but can usually get my hands on something here that's acceptable. You laid on a pretty good spread, considering this was your "short of time" option! Thanks, Pauline. One thing kind of leads to another when it comes to tea! There is one traditional tea sandwich I don't like - smoked salmon. Just don't like it, always ask them to give me another egg sandwich instead. Hi again, Jean! Just wanted to let you know that I'm featuring this post at Hearth and Soul this week as part of my summer entertaining features. Thank you so much again for sharing it! April, thank you so much! What a sweet gift. I have a friend who has the exact same set, in fact she has a whole set of dishes in that design, it is always a treat to be served on them. Your chicken tea sandwiches sound delightful. I just might give it a try. My current favorite chicken salad sandwich is made with chopped pecans and chopped green grapes - ooooh delicious. It is a little tedious chopping the grapes - I've not found a fast way to chopt them up without mushing them - but so good and worth the time. I love your blog - such wonderful recipes - and tea. Thank you so much, JoAnn! And I must try your sandwich with pecans and grapes. 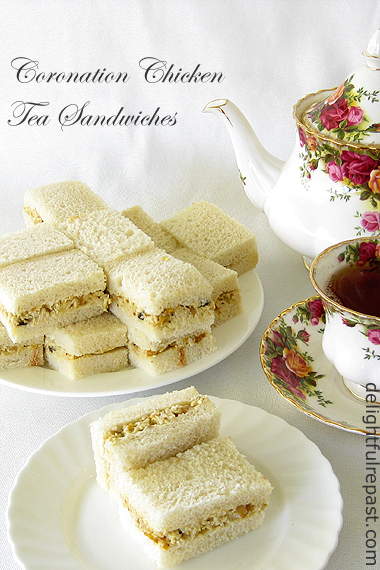 A good tea sandwich is always worth tedious chopping! :-) I hope you'll enter the tea giveaway as well. Jean, your chicken sandwiches sound delightful and I love a good chicken salad sandwich with tea! I love the OCR pattern and I have acquired a few special pieces. How lovely you have been gifted your friend's set to enjoy. Merry Christmas! Thanks for visiting my blog! Yes, that's the same Old Country Roses teapot set that I have. 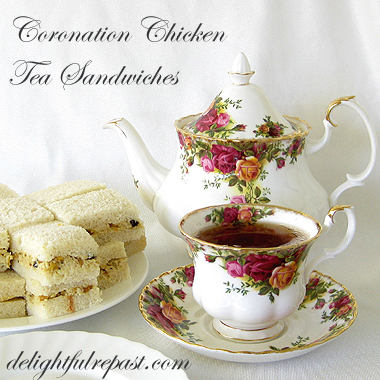 Love your Coronation Chicken recipe - will definitely try it for my next afternoon tea. Thanks, Pamela! I hope you and your guests will enjoy the sandwiches! Gracious, 74 comments here already! Your coronation chicken recipe sounds wonderful. I must admit that though I don't watch my weight particularly well any more anything with a half cup of mayonnaise is enough to put me off. And, to be honest, anything with a long ingredients list as well. I long ago decided, after years of observation, that my family and friends were easily divided into one of two camps sewing-wise: one either loved hand sewing or machine sewing, rarely both. People who preferred hand sewing were like me: loathe to cut into that large piece of fabric; others just hacked away merrily. (I solved that problem by doing patchwork with other peoples' scraps). So, too, do people seemingly fall into one of two cooking camps: a recipe-follower or a makeitup-as-you-go person. I was the former until I discovered Universal Recipes in the Tightwad Gazette. From then I was the latter. Reading recipes does inspire me to try new things, though. Will think of some of those uneaten packets of dried fruits a bit differently next time I'm cooking poultry for dinner...cross your fingers for me! Shelley, I think you're right about the two camps: I'm definitely a machine sewer and a make-it-up-as-I-go cook. But since I'm a recipe developer, I make sure to write it down as I go! Like my mother before me, I read cookbooks like novels.